"Starting St Margaret's in 7 Junior has been fantastic for my daughter. She has really benefitted from the input of so many specialist teachers, and the academic rigour is preparing her very well for secondary school." Choosing the right school is one of the most important decisions you will make. The best way to learn about St Margaret's and its unique ethos is to visit us in person. We make it our priority to ensure your family's admissions experience is welcoming and individualised, and our staff will assist you in making the process of entry to St Margaret's as easy as possible. Please do contact us to arrange a visit or simply to have a chat, so that you can find out more about what St Margaret's can offer your daughter. 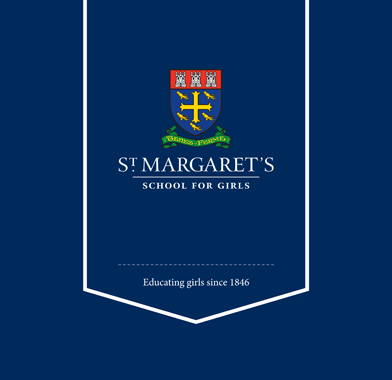 If you wish to receive a copy of The St Margaret's Information Pack, please fill in the form below. VI Senior Pupils reflect from St Margaret's School for Girls on Vimeo. Entry at all levels is conditional on assessment, either formal or informal. Prospective parents and pupils are invited to visit the school for a tour, and girls from 2 Junior upwards are welcome to come in for a trial day with their current year group. Girls are admitted at all stages of their education, from nursery to 6th year. We also welcome boys aged 3-5 years in our nursery. Means-tested bursaries of up to 100% remission on fees are available to qualifying girls entering 6 and 7 Junior and I Senior. Assessment dates are in January and February. Means-tested busaries of up to 50% remission on fees are also available for entry into V and VI Senior. Awards for all bursaries are allocated on the basis of the entrance examination performance and financial need. Please contact our Bursar, Mr Anthony Mountain, on 01224 588004 for further information. Entry to St Margaret’s for all ages is by assessment or is based upon formal examination results and interview with the Head. All children are required to be registered before attending a taster day at St Margaret’s School or before being assessed for a place. Please complete and return the registration form with the (non-returnable) registration fee of £50. Registration forms may be found in the prospectus pack or can be downloaded from the website. We advise you to register as soon as you have decided upon St Margaret’s as a choice of school. Demand for spaces is high, and we operate a strict waiting list policy, according to date of registration. Please note that all girls for entry to our senior school must have a good command of written and spoken English. Please see our Admissions Policy for specific admissions information for each year group. To receive an information pack please submit your email address below. Would you like to subscribe to emails about school news and events?